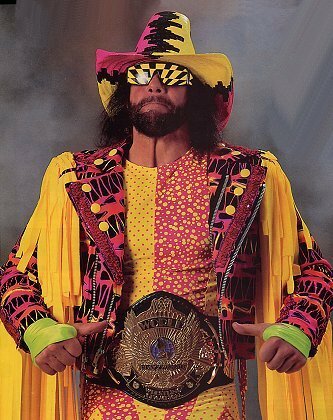 I have just heard the terribly sad news that legendary pro-wrestler 'Macho Man' Randy Savage (real name Randall Mario Poffo) passed away today as a result of injuries sustained in a car accident. News reports that he suffered from a heart attack whilst driving which caused him to crash his vehicle. The 'Macho Man' and his wife, to whom he got married last year were rushed to hospital where he died from his injuries shortly after. His wife fortunately only sustained minor injuries. Officials say that both were wearing their seat-belts, and that alcohol wasn't a factor. I've been a fan of Randy ever since I first started watching wrestling in 1991. I'll never forget the first time I saw this incredibly flamoyant, but charismatic performer. It was the then WWF now WWE)'s Tuesday In Texas event, which saw the Macho Man embroiled in a vicious feud with the legendary Jake 'the Snake' Roberts. And man what a feud it was!! After what was one of my favourite matches that night, the evil and sadistic Jake Roberts slapped Randy's beautiful wife Elisabeth while a helpless 'Macho Man' could do nothing but watch... which led to an out-of-control Randy Savage attacking the 'snake-man' at every opportunity! Savage's wild, intense high-flying wrestling style was always a joy to watch as well... and he entertained this wrestling fan throughout the years with awesome matches with the likes of 'Nature Boy' Ric Flair (another classic feud involving the beautiful Miss Elisabeth), 'Hollywood' Hulk Hogan, Diamond Dallas Page and the Ultimate Warrior. These, coupled with his equally entertaining promos and legendary catchphrases (OOOOOOOOOOOO YEEAAAAHHHHHHHHH!) 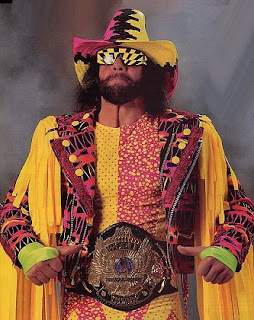 made the Macho Man one of my all-time favourites to watch. Imagine then, how thrilled I was when, back in 1993 I attended a WWF event in Cardiff... and one of the main events was Macho Man Randy Savage versus then Intercontinental Champion Shawn Michaels (I'm sure it was HBK.. if anyone who reads this was in attendance that night, please let me know if this is right). Again, one of the best matches of the night (as was the usual for me when the 'Macho Man' was on the card).. and when the match came to an end, and Randy was going past all the fans at ringside... I was absolutely ecstatic when the 'Macho Man' high-fived me (well, the tip of my hand anyways... but the fact is he reached out to me, which meant the absolutely world to me). That is a moment I will always, ALWAYS treasure.